or don their robes and pointed hoods ... and crawl back into the 19th. The importance of imagery and symbolism should not be underestimated and their significance never dismissed. 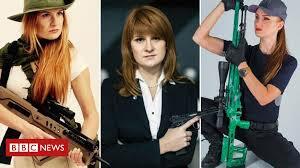 The highest-ranking and longest-serving members of the US counter espionage establishment are still trying to come to grips with how easy it was for the Russian agent, Maria Butina, to don the appropriate attire, brandish a few pistols and rifles, be photographed with and bed a few 50 something officials from the Republican Party, the NRA and the Conservative movement in the United States, and infiltrate and exert influence within the highest levels of those organizations. The phrase 'it can't be that easy' is often uttered in meetings of US counter espionage officials, agents, operatives and analysts, according to confidential sources. But US intelligence and security services have been forced to conclude that it was just that easy for an agent, working for Russian military intelligence, to commit a long series of acts of espionage within the United States. 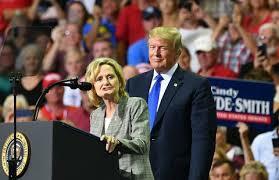 Cindy Hyde-Smith, an appointed US Senator, donned the appropriate attire (a Confederate soldier's cap), brandished a long rifle, spoke of lynchings and suppressing the votes of students and ... the rest of the story is too sordid to delve into here, but the message is crystal clear. And yes, it is just that easy. 17 years ago, when Hyde-Smith was a second-year Mississippi State Senator, she introduced Senate Bill 2604, which would have renamed a stretch of highway to a designation it had in the Jim Crow era of the 1930's -- Jefferson Davis Memorial Highway. It should be noted that while Davis was the president of the Confederacy and did have ties to the state of Mississippi — representing it in the US Senate before resigning when Mississippi left the Union — he had no discoverable ties to Hyde-Smith's district. This was purely a symbolic act on Hyde-Smith's part, and although she did not represent a non ethically diverse state senatorial district. She openly and purposely let it be known that she represented only one ethnic group from that district. Which begs the question, why was she selected to be a representative of Mississippi as a whole, when nothing in her background or history would lead anyone to believe that she would represent every citizen according to the constitution, without regard to ethnicity. Unless, she was appointed to do what she has always done, and that is to project an image of Mississippi as a bastion of the old deep South. And, that draws into question who appointed her and their motivation for doing so. 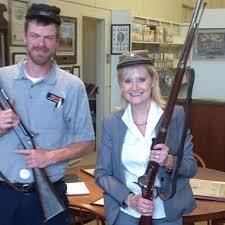 ​The now infamous photograph of Hyde-Smith wearing a confederate soldier's cap is the exact image she garners. Requesting a front row seat to barbarity and posing for a photograph with a member of the Free Mississippi hate group, illustrate two important aspects of her vision of what her segment of Mississippi society stands for. And these actions represent the cornerstone of Hyde-Smith's platform, upon which she has run campaign after campaign. The people of Mississippi are faced with a stark choice on Tuesday, they can either hold their heads high and walk upright into the 21st century, or don their robes and pointed hoods, conceal their faces and slither back into the 19th. The election between Espy and Hyde-Smith, is in essence, a referendum on Mississippi's place within the Union. ​On one side is the image of a new South, which seeks greater ethnic harmony. And on the other, the old South, the Confederacy and ethnic animus. Although the Democrat senatorial candidate, Espy, lost the election, he achieved more electoral success than any democrat since the era when southern democrats won elections in Mississippi. But that bit of good news cannot be seen as a sliver lining to the fact that Hyde Smith won the senate seat. And as such she joins a slew of like minded white nationalists in the US senate. This is not good news. Trump recently cutoff the funding for a program within the Justice Department that was specifically entrusted to counter, interdict and bring to justice right-wing hate groups and their followers who have caused race-related hate crimes to increase exponentially in the United States.